Enugu Rangers opened their Nigeria Professional Football League (NPFL) with a leggy 1-0 win over southeast rivals, Enyimba on Saturday. It was Bitrus Dada's first half goal at the Nnamdi Azikiwe Stadium in Enugu that proved enough to claim the full points for the hosts in the 18th southeast derby in the last 10 years between both sides. 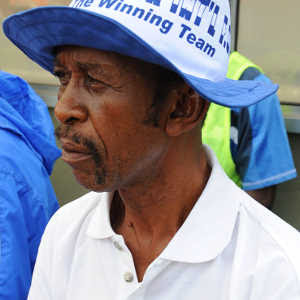 Rangers' head coach, Okey Emordi (In pic), elected to start with just one high-profile player in Chibuzor Okonkwo while Enyimba head coach, Salisu Yusuf opted for steel in the middle with Linus Adams, Turba Benjamin and Rasheed Olabiyi and without a front man. As early as the 11 minute Dada was in a good position to fire Rangers in front but instead he shot wide after Ogonna Uzochukwu's header dropped fine to him inside the box. On 26 minutes, it was a sting in the tail for Enyimba. Ex-Unicem Rovers' man, Dada made amends for his earlier miss by scoring the goal that turned out to be the winner for Rangers after Enyimba failed to clear their lines. In spite of Enyimba claiming more of the ball possession, the Flying Antelopes looked more threatening in the last 10 minutes of the first half. With a minute to the break, Oghogho Oduokpe raced through on goal but shot tamely at Enyimba goalkeeper, Paul Godwin. The People's Elephants started on the front foot in the business end of the game and impressive Rangers' right-back, Chibuzor Okonkwo, had to make a last ditch tackle to keep his team in the lead eight minutes into the restart. Last season's League Bloggers Awards (LBA) Rookie of the Year, Andrew Abalogu switched from left to right and back but always had big Senegalese centre-half, Pierre Coly, snapping at his heels. On 64 minutes, Oduokpe harassed a hesitant Enyimba back line to steal a shot at the far end but Godwin palmed out for a corner as Rangers went in search of an insurance goal. Minutes later, Chinedu Udeagha's 35-yard strike was pushed out by Godwin. The People's Elephants within minutes were on the counter-attack and Sibi Gwar's poor strike was turned out by Rangers keeper, Godwin Anyalogu. Rangers had desperate spells inside the last quarter of an hour but defended with bodies behind the ball. In spite throwing the kitchen sink at the hosts, Enyimba surrendered all points to their rivals like the previous two seasons when they lost in this same corresponding fixture by a similar scoreline. Matchday 1 of the NPFL continues with nine matches on Sunday.